Someone paid Macy’s a lot of money to get their balloon in the Thanksgiving Day parade. The Joker convinces the Penguin to steal something for him and comes up with a plan to embarrass Batman. It involves Penguin bankrupting Gotham’s financially wealthy and using the money himself to give to charities, thus improving his reputation, but he manages to hide his part in the robberies. Batman uses his Bruce Wayne identity to come up with a plan to expose Penguin’s plans but the Joker has what he wanted. What they got right: In the DCAU interpretation (at least in during Fox’s run) Penguin just wants to be among the societal elite and tries to bring culture to his underlings. 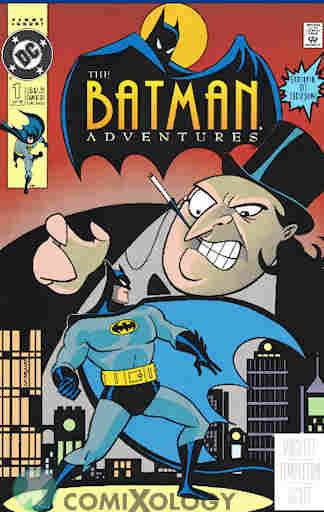 While I don’t like the Fox period design of the Penguin (too close to Tim Burton’s design…this is one of the few Kids WB redesigns I actually think was an improvement) the comic resembles the show’s art style, which as you may recall from the regular DCAU reviews was rare at the time. What they got wrong: Why was Penguin’s name on the plaque instead of Oswald Cobblepot, his real name? I would think he would want his actual name and not his criminal alias on his award, and can they really just hand it over to someone who made a last-minute donation? It doesn’t really make Bruce look all that good, even though it was part of his plan to expose the Penguin. Recommendation: A fair issue. The Joker’s plot continues next issue but I don’t know how much this story is needed for that or if that one is any good. This is the one I have on comiXology and it’s not a bad read. Posted by ShadowWing Tronix on March 30, 2019 in Animation Spotlight, DC Spotlight, Television Spotlight, Yesterday's Comics and tagged Batman, DC animated universe, DC Comics, DCAU, The Joker, The Penguin.